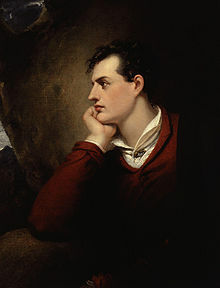 George Gordon (Noel) Byron, 6th Baron Byron (January 22 1788 – April 19 1824), generally known as Lord Byron, was an English poet and leading figure in Romanticism. He was the father of the mathematician Ada Lovelace. My great comfort is, that the temporary celebrity I have wrung from the world has been in the very teeth of all opinions and prejudices. I have flattered no ruling powers; I have never concealed a single thought that tempted me. Of him who treasures up a wrong. The First Kiss of Love, st. 7 (1806). Farewell! if ever fondest Prayer (1808). I only feel — farewell! farewell! Farewell! If Ever Fondest Prayer (1808), st. 2. When We Two Parted (1808), stanza 1. When We Two Parted (1808), st. 4. Inscription on the monument of a Newfoundland dog (1808). Maid of Athens, st. 1 (1810). And Thou Art Dead as Young and Fair (1812). Ode to Napoleon Bonaparte, st. 29 (1814). The Glory and the Nothing of a Name. Letter to Thomas Moore (9 April 1814). 'Gainst thee shall my heart rebel. Fare Thee Well, st. 1 (1816). As men's have grown from sudden fears. The Prisoner of Chillon, st. 1 (1816). In any shape, in any mood. The Prisoner of Chillon, st. 8. The Prisoner of Chillon, st. 10. Stanzas for Music (March 1815), reported in Bartlett's Familiar Quotations, 10th ed. (1919). Is thy sweet voice to me. Stanzas for Music, st. 1 (1816). Stanzas to Augusta, st. 1 (1816). Stanzas to Augusta (1816), reported in Bartlett's Familiar Quotations, 10th ed. (1919). Epistle to Augusta, Stanza 3, reported in Bartlett's Familiar Quotations, 10th ed. (1919). Song for the Luddites (1816). But, before I go, Tom Moore. To Thomas Moore, st. 1 (1817). To Thomas Moore, st. 2. 'T is to thee that I would drink. To Thomas Moore, reported in Bartlett's Familiar Quotations, 10th ed. (1919). And get knock'd on the head for his labours. Then battle for freedom wherever you can. And, if not shot or hang'd, you'll get knighted. Stanzas Written on the Road Between Florence and Pisa, st. 1 (1821). And the greatest of all is John Bull! Letter to Thomas Moore (22 June 1821). Send me no more reviews of any kind. — I will read no more of evil or good in that line. — Walter Scott has not read a review of himself for thirteen years. Letter to his publisher, John Murray (3 November 1821). He is all-powerful, must all-good, too, follow? Which I must feed on for a fault not mine. Cain (1821), Act I, sc. i. And so I live. Would I had never lived! For life, nor did I make myself. Cain (1821), Act III, sc. i. "'Twas one of my feats." Werner, Act I, sc. i (1822). Cheers the tar's labor or the Turkman's rest. The Island (1823), Canto II, Stanza 19. Thy naked beauties—give me a cigar! The Island (1823), Canto III, Stanza 5. The Deformed Transformed, Act III, sc. i (1824). On This Day I Complete My Thirty-Sixth Year, st. 2 (1824). On This Day I Complete My Thirty-Sixth Year, st. 10. Memorandum reference to the instantaneous success of Childe Harold and quoted in Letters and Journals of Lord Byron by Thomas Moore (1830), chapter 14. As quoted in Conversations of Lord Byron with Thomas Medwin (1832), Preface. The Waltz, reported in Bartlett's Familiar Quotations, 10th ed. (1919). Marino Faliero, Act II, Scene 2, reported in Bartlett's Familiar Quotations, 10th ed. (1919). Quoted by Marguerite Gardiner, Countess of Blessington in Conversations of Lord Byron with the Countess of Blessington (1834). Lord of himself,—that heritage of woe! Lara, Canto I, Stanza 2, reported in Bartlett's Familiar Quotations, 10th ed. (1919). Parisina, Stanza 1, reported in Bartlett's Familiar Quotations, 10th ed. (1919). Some features of my father's face. Parisina, Stanza 13, reported in Bartlett's Familiar Quotations, 10th ed. (1919). Born in the garret, in the kitchen bred. A Sketch, reported in Bartlett's Familiar Quotations, 10th ed. (1919). Whose table earth, whose dice were human bones. Age of Bronze, Stanza 3, reported in Bartlett's Familiar Quotations, 10th ed. (1919). I loved my country, and I hated him. The Vision of Judgment, lxxxiii, reported in Bartlett's Familiar Quotations, 10th ed. (1919). L'Amitié est l'Amour sans Ailes, reported in Bartlett's Familiar Quotations, 10th ed. (1919). What say you to such a supper with such a woman? Note to a Letter on Bowles's Strictures, reported in Bartlett's Familiar Quotations, 10th ed. (1919). A book's a book, although there's nothing in 't. Save censure — critics are ready-made. You trust in critics, who themselves are sore. Better to err with Pope, than shine with Pye. Perverts the Prophets and purloins the Psalms. And wing'd the shaft that quiver'd in his heart. Though Nature's sternest painter, yet the best. Now melt into sorrow, now madden to crime! Canto I, stanza 1; this can be compared to: "Know'st thou the land where the lemon-trees bloom, / Where the gold orange glows in the deep thicket's gloom, / Where a wind ever soft from the blue heaven blows, / And the groves are of laurel and myrtle and rose!" Goethe, Wilhelm Meister. And all, save the spirit of man, is divine? Canto I, Stanza 6; this can be compared to: "The bloom of young Desire and purple light of Love", Thomas Gray, The Progress of Poesy I. 3, line 16; also: "Oh, could you view the melody / Of every grace / And music of her face", Richard Lovelace, Orpheus to Beasts; "There is music in the beauty, and the silent note which Cupid strikes, far sweeter than the sound of an instrument", Thomas Browne, Religio Medici, Part ii, Section ix. To fix one spark of beauty's heavenly ray? The might, the majesty of loveliness? The blind old man of Scio's rocky isle. He makes a solitude, and calls it — peace! Canto II, stanza 20. Here Byron is using an adaptation of a quote from Agricola by the Roman historian Tacitus (c. 30). The original words in the text are Auferre, trucidare, rapere, falsis nominibus imperium; atque, ubi solitudinem faciunt, pacem appellant (To robbery, slaighter, plunder, they give the lying name of empire; they make a wilderness, and call it peace). This has also been reported as Solitudinem faciunt, pacem appellant (They make solitude, which they call peace). "Where is my child? "—an echo answers, "Where?" Though baffled oft, is ever won. And come what may, I have been blessed. Have swept the lines where beauty lingers. 'T is Greece, but living Greece no more! Except an erring sister's shame. The waste of feelings unemployed. Than moulder piecemeal on the rock. Their love can scarce deserve the name. To lift from earth our low desire. Oh who can tell, save he whose heart hath tried. Canto I, stanza 1; this can be compared to: "To all nations their empire will be dreadful, because their ships will sail wherever billows roll or winds can waft them", Dalrymple, Memoirs, vol. iii, p. 152; "Wherever waves can roll, and winds can blow", Charles Churchill, The Farewell, Line 38. We promise, hope, believe,—there breathes despair. Canto III, stanza 24; this can be compared to: "Hannibal, as he had mighty virtues, so had he many vices; he had two distinct persons in him", Robert Burton, Anatomy of Melancholy, "Democritus to the Reader". She Walks in Beauty, st. 1. The subject of these lines was Mrs. R. Wilmot.—Berry Memoirs, vol. iii. p. 7. The Destruction of Sennacherib, st. 1. For the Angel of Death spread his wings on the blast. The Destruction of Sennacherib, st. 3. And broke the die, in molding Sheridan. Line 117; this can be compared to: "Natura il fece, e poi ruppe la stampa" (translated: "Nature made him, and then broke the mould"), Ariosto, Orlando Furioso, canto x, stanza 84; "The idea that Nature lost the perfect mould has been a favorite one with all song-writers and poets, and is found in the literature of all European nations", Book of English Songs, p. 28. Stanza 2; this can be compared to: "She floats upon the river of his thoughts", Henry W. Longfellow, The Spanish Student, act ii, scene 3. Was thine — and thou hast borne it well. Think'st thou existence doth depend on time? Why are ye beautiful? I cannot love ye. Art a delight—thou shin'st not on my heart. Which I outlive!—Ye toppling crags of ice! In mountainous o'erwhelming, come and crush me! And only fall on things that still would live. Of the snow-shining mountains. Beautiful! With silent worship of the great of old! Old man! ’tis not so difficult to die. Who still become more constant as they cool. Stanza 34; this can be compared to: "My heart is wax to be moulded as she pleases, but enduring as marble to retain", Miguel de Cervantes, The Little Gypsy. Which we're obliged to hiss, and spit, and sputter all. Soft as her clime, and sunny as her skies. O Mirth and Innocence! O milk and water! Ye happy mixtures of more happy days. I am not what I should be — let it end. By all that's good and glorious. And impulse — borne away with every breath! Misplaced upon the throne — misplaced in life. And I — let me say we — shall yet be happy. An empire to indulge thee. My best! my last friends! And clog the last sad sands of life with tears. There be: I shall know soon. Farewell — Farewell. Shall sink while there's an echo left to air. It would be difficult, perhaps, to find the annals of a nation less stained with crimes than those of the Armenians, whose virtues have been those of peace, and their vices those of compulsion. But whatever may have been their destiny — and it has been bitter — whatever it may be in future, their country must ever be one of the most interesting on the globe. From the Letters of Lord Byron (2 January 1817), p. 6. [Armenian] is a rich language, however, and would amply repay any one the trouble of learning it. "To Mr. Moore", From the Letters of Lord Byron, 5 December 1816, p. 12. And Europe made his woe her own? Matthew Arnold, "Stanzas from the Grand Chartreuse," Fraser's Magazine (April 1855); reprinted in New Poems (1867). 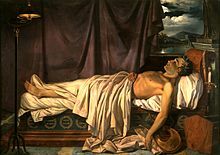 If they had said that the sun or the moon had gone out of the heavens, it could not have struck me with the idea of a more awful and dreary blank in creation than the words: "Byron is dead!" Jane Welsh Carlyle, letter to Thomas Carlyle (20 May 1824). The world is rid of Lord Byron, but the deadly slime of his touch still remains. John Constable, letter to the Rev. John Fisher (May 1824). Lord Byron is great only as a poet; as soon as he reflects, he is a child. Johann Wolfgang von Goethe, said in conversation (18 January 1825) with Johann Peter Eckermann, quoted in Eckermann's Conversations with Goethe (1836). 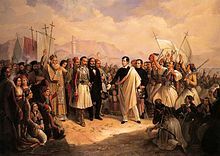 It still saddens me that Lord Byron, who showed such impatience with the fickle public, wasn't aware of how well the Germans can understand him and how highly they esteem him. 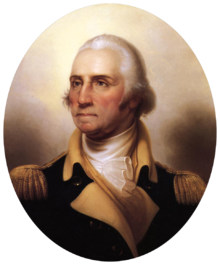 With us the moral and political tittle-tattle of the day falls away, leaving the man and the talent standing alone in all their brilliance. Johann Wolfgang von Goethe, letter to John Murray (29 March 1831). William Hazlitt, "Lord Byron," The Spirit of the Age (1825). Whatever he does, he must do in a more decided and daring manner than any one else; he lounges with extravagance, and yawns so as to alarm the reader! In a room at the end of the garden to this house was a magnificent rocking-horse, which a friend had given my little boy; and Lord Byron, with a childish glee becoming a poet, would ride upon it. Ah! why did he ever ride his Pegasus to less advantage? Leigh Hunt, Autobiography (1850), vol. II, ch. XV. The list of writers, artists, and composers who were directly inspired by Byron's life and poetry is almost without peer; it includes Hector Berlioz, Alexander Pushkin, J. M. W. Turner, Robert Schumann, Victor Hugo, Alfred-Victor de Vigny, Alfred de Musset, Giuseppe Verdi, Gaetano Donizetti, Franz Liszt, Peter Ilyich Tchaikovsky, Arnold Schoenberg, Gioacchino Rossini, Charles Baudelaire, and Virgil Thomson. 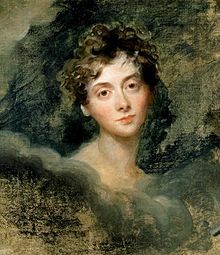 Not surprisingly, most of these influenced by Byron were themselves intensely emotional and inclined toward the Romantic. Katherine Kernberger (22 September 2017). The Leslie A. Marchand Memorial Lectures, 2000–2015: A Legacy in Byron Studies. University of Delaware Press. p. 49. ISBN 978-1-61149-668-0. You speak of Lord Byron and me — there is this great difference between us. He describes what he sees — I describe what I imagine. Mine is the hardest task. John Keats, letter to George and Georgiana Keats (September 1819). From the poetry of Lord Byron they drew a system of ethics, compounded of misanthropy and voluptuousness, a system in which the two great commandments were, to hate your neighbour, and to love your neighbour's wife. Thomas Babington Macaulay, in "Moore's Life of Lord Byron" (June 1830), from Critical and Historical Essays Contributed to the Edinburgh Review (1843), vol. I.
I never heard a single expression of fondness for him fall from the lips of any of those who knew him well. Thomas Babington Macaulay, letter to Hannah and Margaret Macaulay (7 June 1831). Tragedy of childhood. 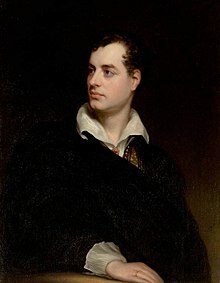 Not infrequently, noble-minded and ambitious men have to endure their harshest struggle in childhood, perhaps by having to assert their characters against a low-minded father, who is devoted to pretense and mendacity, or by living, like Lord Byron, in continual struggle with a childish and wrathful mother. If one has experienced such struggles, for the rest of his life he will never get over knowing who has been in reality his greatest and most dangerous enemy. Always looking at himself in mirrors to make sure he was sufficiently outrageous. Enoch Powell, Sunday Times (8 May 1988). Had Byron never written a line of poetry, his letters would give him a place in literature. Our Lord Byron — the fascinating — faulty — childish — philosophical being — daring the world — docile to a private circle — impetuous and indolent — gloomy and yet more gay than any other. Mary Shelley, letter to John Murray (19 January 1830). If I could envy any man for successful ill nature I should envy Lord Byron for his skill in satirical nomenclature. Sydney Smith, letter to Elizabeth Vassal Fox, Lady Holland (June 1810). Anne Isabella Thackeray, Lady Ritchie, Records of Tennyson, Ruskin, and Robert and Elizabeth Browning (1892).